When Virginia Kutsop was born, she was brought home from the hospital in the family 1995 Ford F350 7.3L. Thanks to her father, she’s been around diesels from then on. “It’s been in my blood since day one!” Virginia quips. Having grown up around Fords ensured that when she was ready to start building her own dream truck years later, she knew just what to hunt for. “I’ve always loved the older body style Fords,” she admits. Virginia and her best friend Izzy Nieves spent months tracking down the right engine to place inside. She knew what she was looking for the moment she saw it—a 1996 5.9L 12-valve P-Pumped Cummins. Virginia and Izzy got right to work, stripping the cab and bed on the F150 and following up with some sandblasting and new paint for the F350 frame. They dropped the Cummins in and Virginia was ready to turn her attention to the next set of modifications. She upgraded to 4.11 gears with a Sterling 10.25-inch rear axle and invested in a Stage 3 2000 Ford Power Stroke 4R100 transmission. Virginia went all-out here, including a stand-alone computer, upgraded transfer case, Billet converter, Billet input/output shafts, and upgraded steel gears, clutches and sun shell. Next, the duo installed an improved valve body, modified fuel plate, and advanced the timing for better fuel economy. A new cold air intake and Mishimoto radiator and intercooler upgraded this truck’s cooling performance. 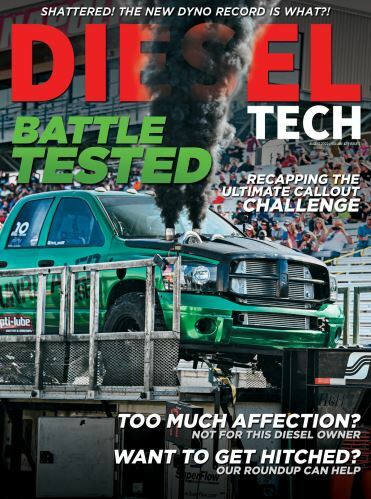 With the additional AirDog II 4G 165 fuel pump and Wicked Wheel turbo, this truck’s power-to-weight ratio was getting ramped up. Virginia also invested in a custom front and rear drive shaft and an eye-catching eight-inch lift on 37s with Fuel Hostage wheels. A 2008 6.4L bumper, roll pan, custom one-piece Flip Em’ Up Customs grille, massive ten-inch exhaust tip, and—last but not least—Dodge tow mirrors all touched up this truck’s old body style look with clean lines and added to that unique flair she was hunting for all along. At this point, Virginia was officially ready to pull everything together and do the swap. “In two days the truck was up and running, two days after that the truck was able to drive around the shop and in a week my baby was drivable on the road!” she grins. This ride was officially ready for a name, and Virginia had no troubles picking one. “Sally is my truck’s name, after Sally from ‘The Nightmare Before Christmas,’ because she was put together with many pieces just like my truck!” she laughs. Virginia has no regrets with her Fummins so far, though it definitely hasn’t always been a smooth road. Of course, there’s always that silver lining. This truck is Virginia’s daily driver, but her plans don’t stop there—she intends to slowly and surely transform her Fummins into a complete show truck. And thanks to the support she’s had along the way, she’s more than ready for the ongoing journey.